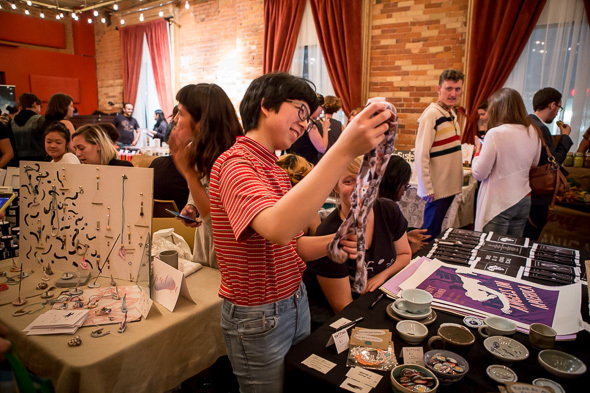 The first ever Bunz flea market kicked off last night bringing the trade-and-barter spirit offline and into the ballroom at the Gladstone Hotel. And crowds poured in carrying bags of tradable goods hoping to score to unique gifts, crafts and other artisanal items. 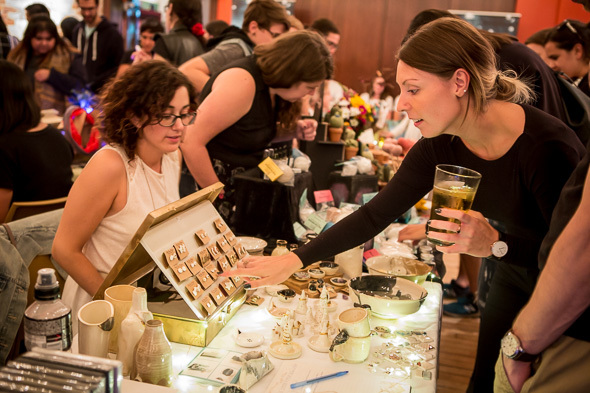 "I thought it would be amazing to bring all the talent that is on Bunz into a trading market," says Bunz Flea co-organizer Alanna Matysek. About a year ago, she founded her greeting card business Matty Play with Paper on Bunz so she wanted to give back to the community. She started this market with Natalie Boustead and they put a call out for vendors on various Bunz Facebook groups (or zones). 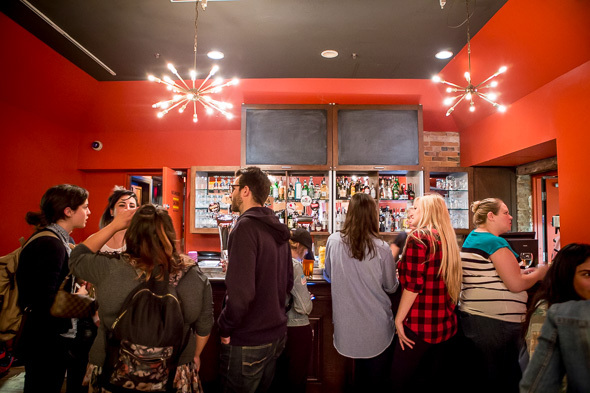 They got around 100 applicants and narrowed it down to about 30 vendors. Last night, they all packed into the ballroom. It was squishy, but in a good way. 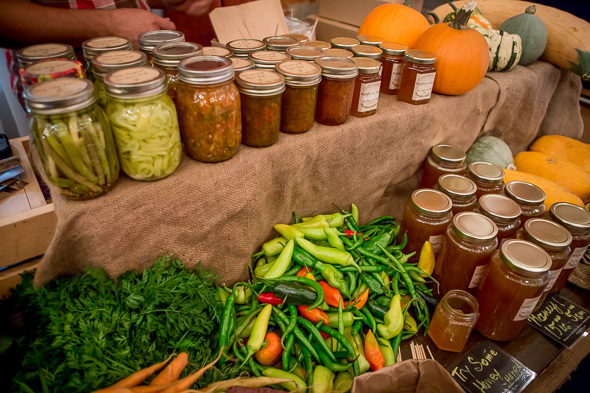 The market felt intimate - kind of like you were sorting through knick-knacks at a cozy apartment. Along with the various artisans, there were also some vendors on site offering services. 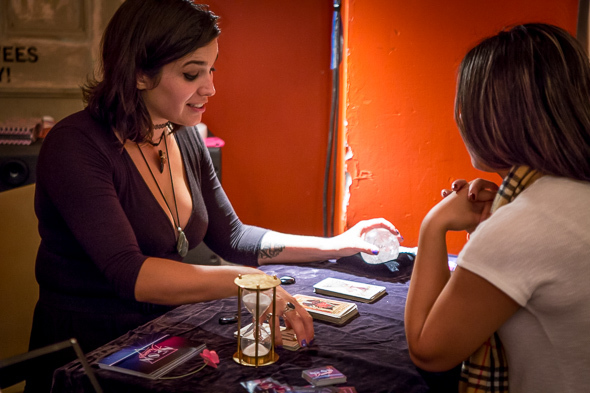 A financial advisor set up at the front of the room beside a poet (writing custom poems) and a tarot card reader. This, Matysek says, was supposed to differentiate the Bunz flea from other local markets. Of course, you could have also gone cashless here. 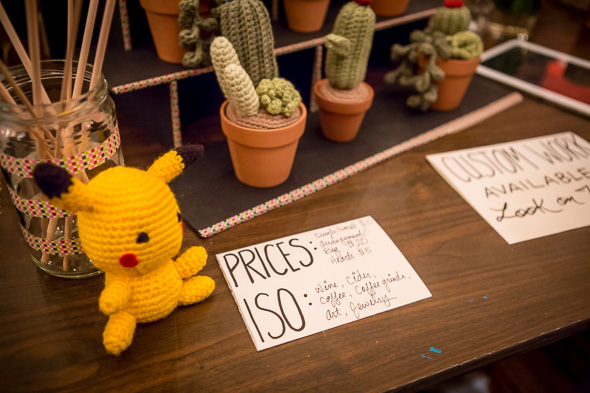 Many vendors put up signs listing what they were in search of (ISO) and many said they were also open to fun trades. Would-be buyers definitely got creative. I saw a couple schlepping around a bag filled with a random assortment of goods to trade with and one vendor showed me an awesome pair of cat socks they got in exchange for a small porcelain dish. I came armed with a gift card (a hot Bunz currency) and some food and ended up trading two boxes of spaghetti for two delicious chocolate chip cookies from Bake Sale! Bake Sale! 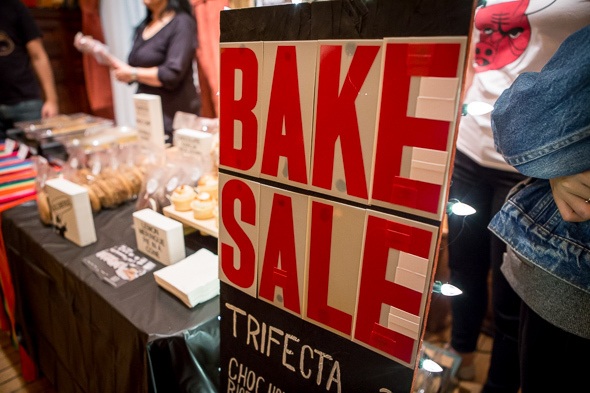 Bake Sale! 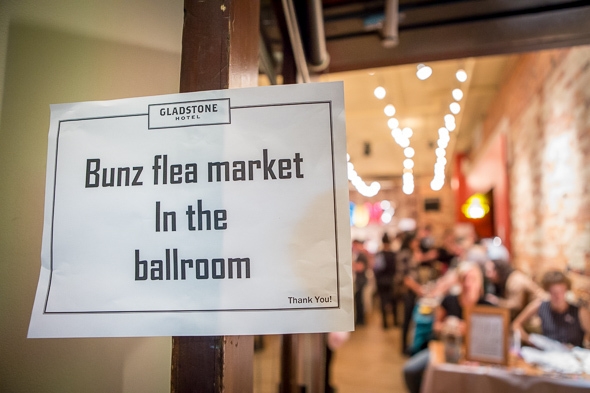 If you missed out last night, the next Bunz Flea is happening on Monday, December 12 at the Gladstone Hotel. Just a hint, most vendors were ISO of tokens, tall cans and art - be prepared.